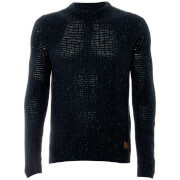 Men’s blue knit jumper from Threadbare. Crafted from pure cotton, the ‘Karlson’ pullover comprises a crew neckline and long sleeves. 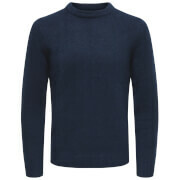 Featuring ribbed trims, the jumper is complete with contrasting shoulder panels, a patch pocket secured with a single button to the chest and a branded Threadbare label.